Use this conforming low-poly head and upper body shell to increase the speed of your dynamic hair drapes and simulations. It conforms to V4 or M4 and will auto fit to Genesis and Genesis 2 (use hair as the type). Put the .car file in your object browser for quick access. Drag onto your instance pane and fit to your figure. Use the adjustement morphs (Model > General tab) to dial in the fit and the hairline and other morphs to adjust as needed. Make sure you turn off "Collide with hairs" on your main figure. Turn off the visibility of the hair collider model during rendering. To save your hair styles just rename and drag onto your object browser to use later. Multiple hairstyles can be built on the same hair collider shell and then hidden/deactivated when not in use. 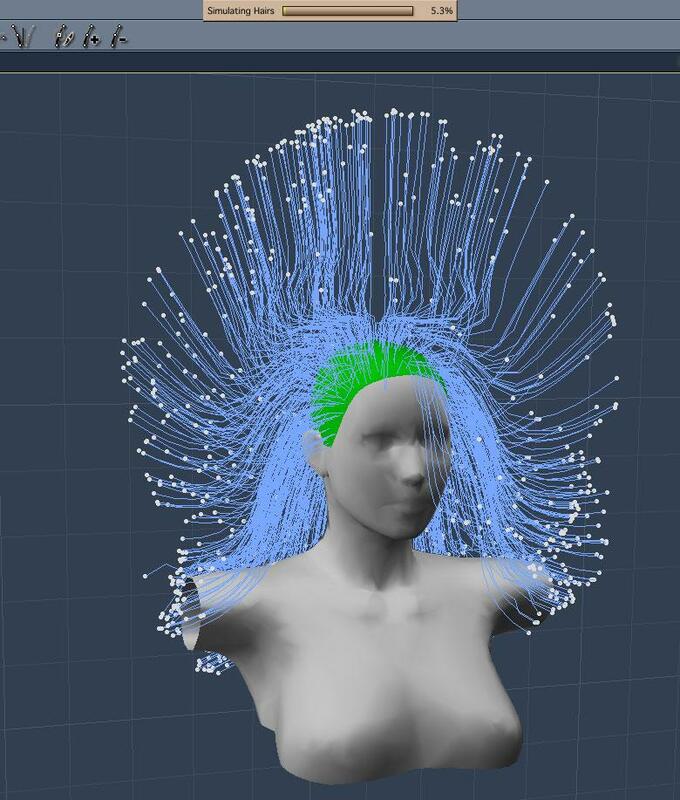 The hair loads with the default hair settings plus a density map for the hairline. Increase your guide count for better collision results. Thank you. Very generous. Very useful. Thank you I will have to see what I cant do with it. I just posted this image in another thread before seeing this one. What a coincidence! This one is using very few hairs with their thickness turned up - meant to go back and increase the quality if I could ever figure out how to get super curly hair like this to animate without glitches. I think it's an anomoly with the fact that the curls are created via the shader, as I still don't know how to make the curls manually and have them hold their shape while still allowing the hair to flow as if it wasn't stiff - a by product of hollding the shape during simulation, I think - but could be wrong. Maybe for my next attempt I'll juust try the same thing but without the curls. I could then see if I can just find a way to add the curls to the dynamic hair in post - something I've dreamt of doing back when I made this. Bummer about the flicker thing. Can we upload the file to Carrara Cafe Downloads too? OK to use this for copyright info? Thanks stringtheory9! I have Jonstark's proxy collider, and Phil's head proxy that came with Adrea Hair. This is a bit different for the back...and will look forward to your collider for wavy hair. I agree, guides are almost impossible to work with. The clumping tool could be better as well. It just does not behave consistently. I love working with hair and this is a great asset. My people have strange head shapes, so anything like this is amazing for me YAY! Right, I've tried the styling tools, Silene, but they come out when animated, especially in three foot long hair. Clumping in the shader has the same problem with flickering, I think... I could be wrong. 3drendero, yes please feel free to do so. There are no restrictions or limits on its use. Silene, I was using Jonstarks collider when I thought it would be cool if it would conform and from there ended up with this. I didn't realise PhilW had a head proxy in Adrea Hair. It's a good way to make dynamic hair interchangeable! Dart, it's a super useful reference! Thanks for adding the link. M4 is no longer feeling left out! I just added an M4 version to the original post. Sweet! Now it's a suite!! !